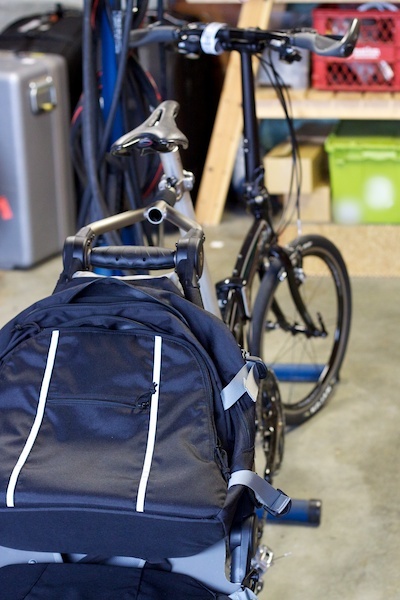 That’s the Burley Travoy and we’ve had it on test for a couple weeks. First rode it to the Bike Expo, meeting a couple engineers from Google Maps along the way, with good results. 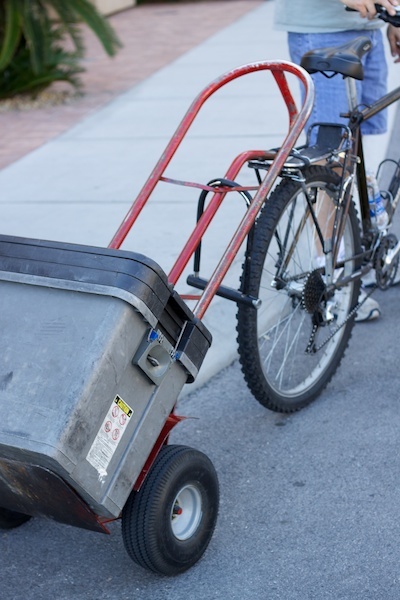 Readers and followers have likely heard me say that the enthusiasm for Cargo bikes in the US is seldom met with well-designed and manufactured equipment. That excludes the true Dutch bikes being imported from the Netherlands cause that stuff works, like it has for decades. My the bike industry needs to innovate tone is driven, in part, by riding bikes sadly mislabeled as cargo bikes. I first spotted a flyer for the Travoy in a bike shop and pinged Burley for a test unit. The Product Manager was enthusiatic to tell me about how much time they spent on it, refining, testing, and getting it out to early users. Yes it’s a trailer and cyclists have been attaching various trailers to their bikes for as long as there were trailers and bikes, but the research and industrial design time Burley spent is evident. Officially, the Travoy is called an Urban Commuter Trailer and is intended to get groceries, errands, and so on. I think you could shake off that urban label and tour with it and the reason is they thought of what people do with trailers and sell snap on/off bags for that purpose. Ride up to a store, quick release it, fill it with groceries, rehitch, and ride home. Load it up with your computer, camera, gear, and ride to a shoot or with a change of clothes to a meeting. My kids are out of baby strollers so I forgot how maddening inflating trailer tires is, but the Travoy has those and I suggested they ship it with a curved inflator adaptor. 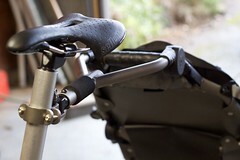 The Travoy quick-releases and folds up like a folding bike. You could pack a bike and the trailer under work cube, or into a small apartment. Likely too cumbersome to get it onto a bus or train, but we’d give that a try. Burley Travoys retail for under $300.00 with various bag configurations and are available on Amazon.com and elsewhere. 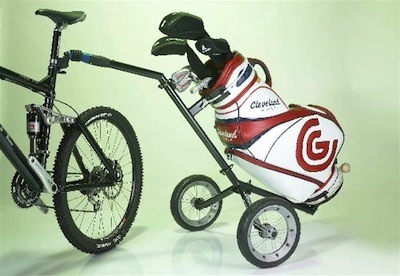 Also for another golf club caddy approach, see this and I don’t know what this does.